The Novakovskis of Saskatoon, SK, love fibreglass trailers like Bolers and Trilliums. We here at RVwest were thrilled to hear from Brenda and Nolan Novakovski, of Saskatoon, Saskatchewan. The Novakovski’s love fiberglass trailers like Bolers and Trillium. They have a rejuvenated one Trillium trailer (a minor project) and are now working on the restoration of their second Trillium (a major project). The Novakovskis are relatively new fiberglass trailer owners. They purchased a 1974 Trillium in July 2002 and called it the green grape. And in September of last year they another Trillium they call Dewey. Dewey is a frame—off restoration project, everything on this trailer needs to be redone. The Novakovskis have chronicled their Trillium restoration adventures including how they were acquired, repaired, renovated and some of their trips. To check out the Green Grape and Dewey visit their websites or Brenda invites you to contact them with questions or comments. 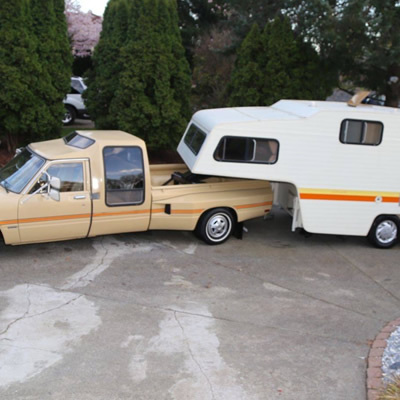 John Douglas Polk from Houston, Texas was lucky enough to find an almost mint Toyota Sunrader combo unit, consisting of truck and fifth wheel. The Novakovskis of Saskatoon, SK, love fibreglass trailers like Bolers and Trilliums. 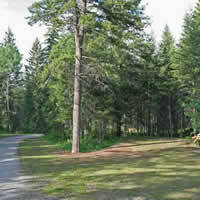 They have rejuvenated one Trillium trailer and are now working on the restoration of their second Trillium.